Producers usually head up the business side of the TV or film production. They have numerous responsibilities which can include anything from the creation and brainstorming of programme ideas to the marketing of the show. In this article, we will talk you through some of the day-to-day tasks of a Producer, the skills you will need to become one, and the best routes in. Producers are responsible for seeking out great ideas for film and TV productions. They’ll spend a lot of time reading and assessing scripts, looking at their quality and deciding whether they want to pursue creative concepts. Or in other words, the ability to spot a good story. There are many forms that this can take, whether it is an original screenplay, a book, or just simply an idea that sounds incredible but hasn’t yet made its way on to paper (a lot of creative vision is essential to this process). Once they have spotted a good story, a Producer will interpret the script and work to turn the writer’s idea into a reality. But, Producers do not spend their time only reading and seeking other’s ideas. Indeed, a Producer may also spend time generating story ideas and researching their own creations. Part of a Producer’s role can include casting. This means they are responsible for hiring the main talent for the production – no small task. Further, they will be responsible for organising auditions and selecting cast members. Then you need to hire a support team that shares your passion to get this story out there. As a producer you need be conscious of the bigger picture at all times. You could consider getting together a press and advertising team to help promote the production once it reaches its final stages. As we said before, Producers are responsible for a lot of the business side of film making. In this day and age simply having a good idea is not enough, you need the funding to make it a reality. Thus, Producers must be effective pitchers and negotiators in order to secure funding from financial backers. During production, producers are responsible for making sure that production stays on time and within budget. But pitching goes beyond securing financial backing: in this role you must be able to pitch your production to broadcasters to ensure distribution and marketing. Promotion of the production is essential and includes obtaining promotional interviews for leading cast members and advertising on a range of platforms to reach the target audiences. In this role, communication skills are a must-have given the number of personnel you’ll have to liaise with on a daily basis. There are many routes to becoming a Producer. Often a degree can be useful when pursuing this career. For instance, a degree in media or a related topic would give you a good grounding. If the university route is not for you, you could look to gain level 3 qualifications at college in media or film production. Further, you could look to take an apprenticeship with a production company. If education is not the route you want to go you could look to gain experience by starting out as a Runner, an entry-level role. Working in a junior role will allow you to gain a good understanding of the entire production process and enable progression in various directions. However, the TV and film industry can be competitive. If you are struggling to get your foot through the door you could look to volunteer at a local community production. Some companies even offer entry-level training schemes. Experience is key, and you will benefit a lot from interning at production companies and attending meetings to gauge what it takes to produce. Another thing to consider is specialising in how you want to produce and develop that skill. Whether it is finding passion projects and making it your job to get stories out there. Or, if you enjoy the financial responsibilities then engage more in that aspect of the process. 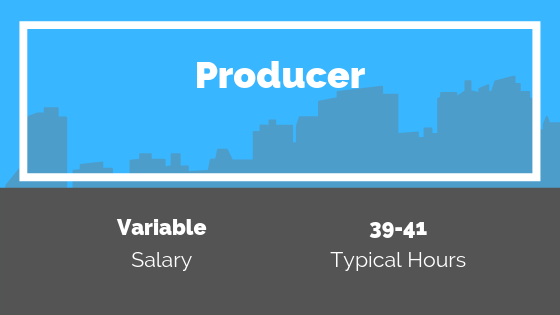 The salary of a Producer can vary hugely depending on the scale and profile of the production, not to mention your level of previous experience. A 2016 survey conducted by Televisual found that the average salary of a producer can vary from £37,000-£45,000 per year. Howver, most roles are freelance, project-based positions. If you are ready for the next step in your career, why not take a look at the latest Producer vacancies on our jobs board? You can view our latest Producer vacancies here.